I go to Pita Plus for two reasons: to eat falafel and to talk to the owner. Every time I walk in, it's the exact same conversation. "Hello! What can I get you?" "I'd like the falafel platter (or, occasionally, falafel pita)." "Pita. Wheat. Okay. You want borek? Is very good." "No, just the falafel today." "We have potato borek, cheese borek, chicken borek, spinach borek..."
"That's okay, I don't need the extra calories." The truth is that I want a borek. Very much so. It should be obvious from reading this blog that I am a disgusting glutton who can't say no to buttery, wonderful food. I feel guilty even looking at those stuffed phyllo pockets, though. In my fatter days, I used to scarf a borek down as I drove home with my sandwich. I still feel the shame. Usually the owner has nothing to say after the borek discussion, but occasionally he'll be in a talkative mood. One time he wanted to know why I was taking pictures of my food, and when I told him I had a blog where I wrote about food he asked "Why?" then laughed to himself. Once he asked me not to speak until he was done checking out a woman walking to her car. I've said it before but it bears repeating: Pita Plus' falafel is what you need to be getting. They show up on the table (on classy styrofoam plates) looking like brown and green ping pong balls, but then you crack through their crunchy exterior and that fluffy neon green interior calls you in. Their mix of chickpeas with onion, garlic, fresh herbs, and a mountain of spices—these have a hint of heat to them—is tough to top. Especially when slathered in tzatziki and their sweat-inducing chili sauce. The platter comes with pita bread (white or wheat? ), a Middle Eastern salad, pickles, olives, and hummus. 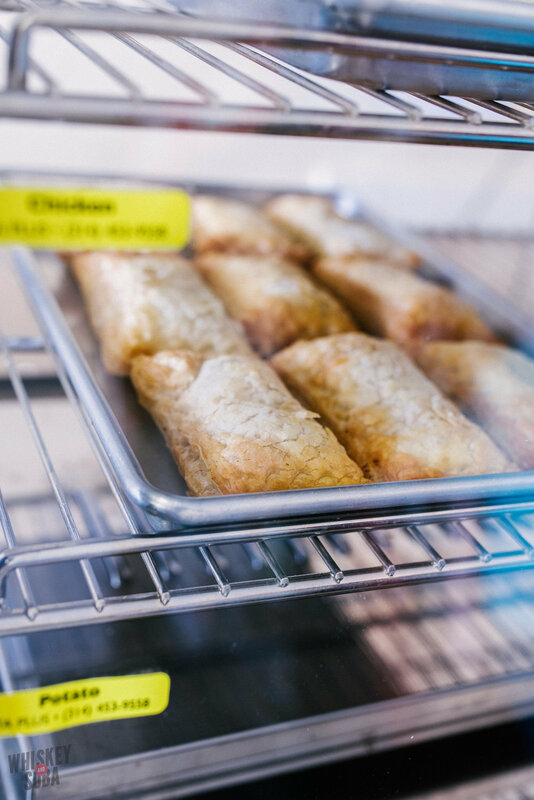 Get a borek while you're there, too. It'll make him feel good. My favorite goes to the potato.